The 2017 legislative session marked the first time the SC General Assembly has operated on a compressed schedule since the passage of session shortening legislation in 2016. The General Assembly now ends its legislative work nearly a month earlier than previous sessions. Those who believe that government should be involved in every aspect of your life argue that the shortened session did not provide the time to address important issues. Those like myself, who believe in bearing down and getting to work rather than exploiting the system to delay debate and decision making, believe the sessions will now be more efficient and will better serve the people. These items have been well documented in previous Constituent Updates, as well as in the general media. But many other items did not receive the same coverage. South Carolinians will soon have the option to obtain an ID that meets compliance with guidelines of the federal REAL ID Act of 2005. South Carolina Driver’s Licenses will now be accepted as adequate identification to board commercial airlines, access military bases, and other federal facilities. Ponzi, pyramid, and other such promotion scheme’s have been added to the South Carolina Unfair Trade Practices Act and entitles victims to seek relief. Confirmed members to the newly constituted independent state Ethics Commission. The commission will have authority to review complaints against those in public office, including members of the General Assembly, as directed by ethics reforms of 2016. 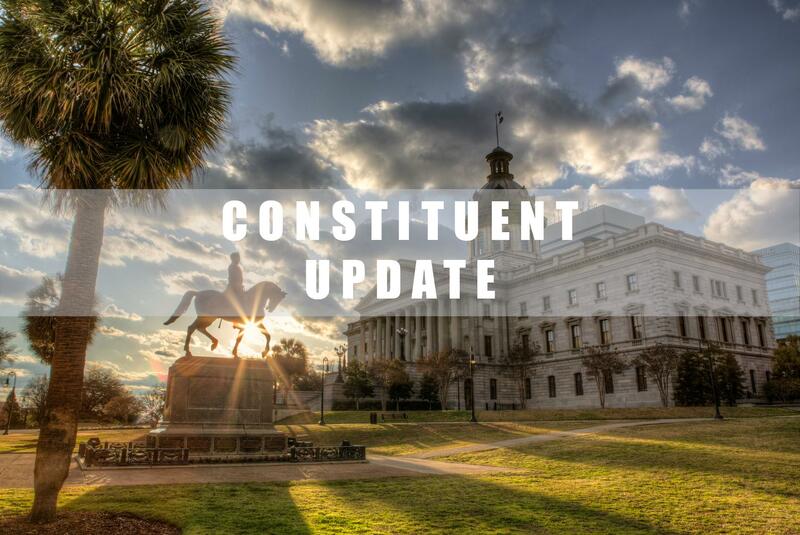 To address mental health and addictive disorders, a growing concern for law enforcement, this bill addresses training of law enforcement on how to best deal with mental illness or addictive disorder crisis cases. Law enforcement certified in S.C. must complete continuing education each year of a three-year certification period. Provides universal local governmental eligibility provision that only governmental entities will be eligible to participate in State Health Plan. It is my hope that this policy will extend to Phase 2 of the public pension reforms that will be necessary to solve our pension problems. Too many non-governmental organizations have been granted the ability to participate in governmental employee benefit programs which has contributed to problems with their long term economic sustainability. Addresses the growing concern of safety surrounding mopeds on the highway. It requires mopeds to be licensed and registered to operate in the state and adopts a unified definition of mopeds that subjects them to the same traffic law as all other vehicles. Establishes criteria for a school accountability system within South Carolina Public schools to make it easier for parents to identify performing, nonperforming or failing schools. Reduces the over testing of students while maintaining reasonable and effective assessment measures. There were numerous instances where over regulation, that did not improve the health and safety of our citizens, was repealed. And several other instances where additional, and often protectionist, regulations were sought and denied. As always, I invite you to share your thoughts on these or any issues. Your input is invaluable to me in the policy making process. K-12 Education Equity Funding Committee - SC has a long known problem of equitable school funding. This is most often discussed as it relates to small rural school districts. But the often overlooked problem is that fast growing districts, like those in our community, are penalized by current funding formulas. It is my view that SC has less of a problem of how much money is spent on education and more of a problem on how the money is spent. This committee will review that issue. 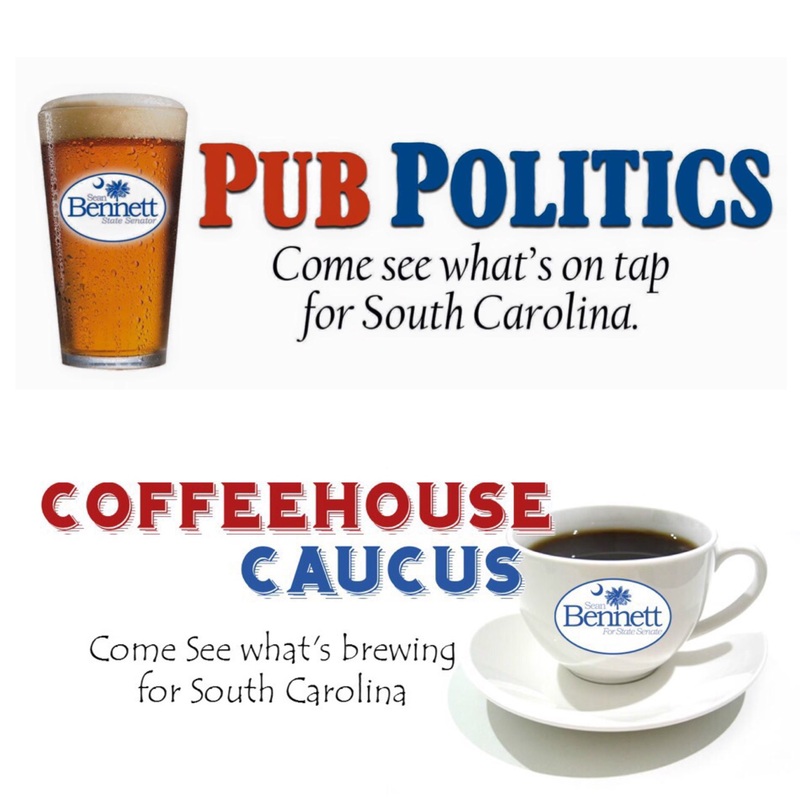 We had a great season of community meetings with our Pub Politics and Coffeehouse Caucus event series. We'll pick back up in the late fall as we head into the 2018 legislative session. I hope to see you then. Look for the schedules here. Those of us that live in District 38 are very lucky to have Margaret Wright in the role of Legislative Assistant. She does a wonderful job of helping constituents out of our State House office. She's been out on maternity leave for the last few months but returned this week. We're glad she's back! I'd also like to thank Vivian McDowell for all of her help while Margaret was gone. We were blessed to have Vivian and her experience. As always, thank you for your support. It is a great honor for me to serve the people of Dorchester, Berkeley, and Charleston Counties. I thank you for this opportunity.